Our day that was dedicated to 'action adventure experiences' had one cultural component: we were able to visit traditionally nomadic hill tribes that had been resettled nearby because of war and political boundary shifts. 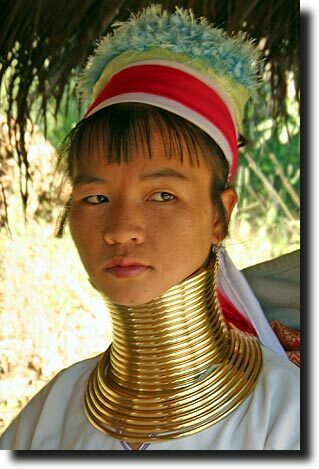 The Karen, or long-neck as they are called in Thailand, have graced the cover on National Geographic many times and so are somewhat familiar to people in the West. 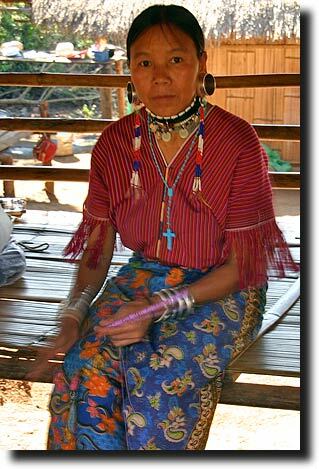 The Karen prefer to live in small settlements in the hills north of Chang Mai. They have resisted integration and education in attempts to preserve their lifestyle. 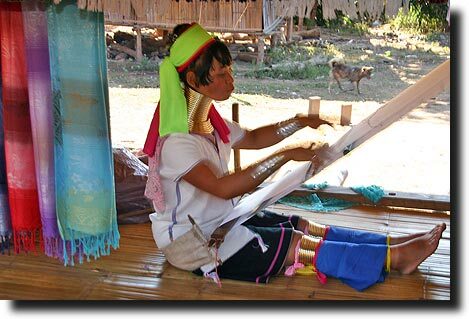 However, financial necessity forces some of them to live in semi-permanent 'tourist villages' near Chang Mai. 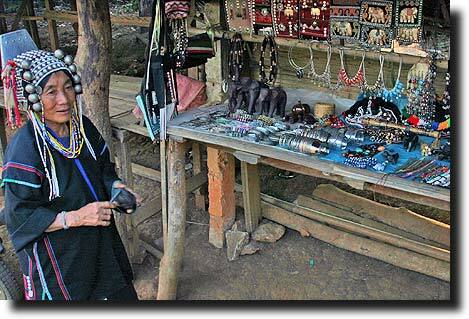 Those who choose to locate here during the tourist season know they do so in order to sell their wares and earn some money. They go back to their families during the rainy season. We saw many women who had set up a 'village' for us to visit. It felt contrived in that there were no men and there were booths set up with things for sale, but their simple homes, gardens and weaving were all authentic. We felt a deep sense of admiration for these women: it could have been a materialistic freak show, but their quiet and purposeful demeanor immediately won our respect and interest. Their weaving was fabulous; we had never seen a horizontal design quite like theirs! 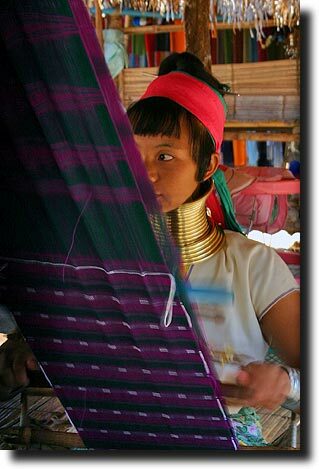 We were told the distinctive neck wear was originally suppose to keep the women safe from tiger attacks (they always go for the neck!). Men don't need to wear one because men are strong and can fight off a tiger(??). The rings have become such an ingrained part of the culture that they keep them as a sign of beauty and community. Girls start wearing a small ring at age 5 and add 2 rings every few years. Contrary to the oft heard myth, a women's head does not fall over if the rings are removed. The rings are not removed as a 'punishment' so that she suffocates. The rings actually push the shoulder blades down. They don't elongate the neck; they just give that illusion. 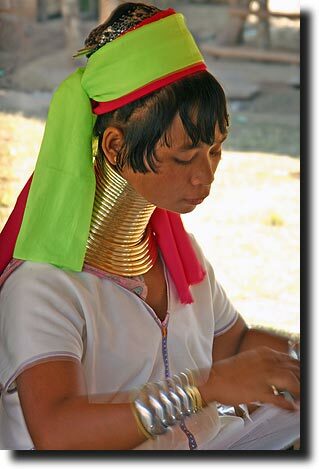 The rings are removed every couple of years so that more metal can be added and so the woman can wash her neck. The Karen also put rings on their arms and legs for additional adornment. 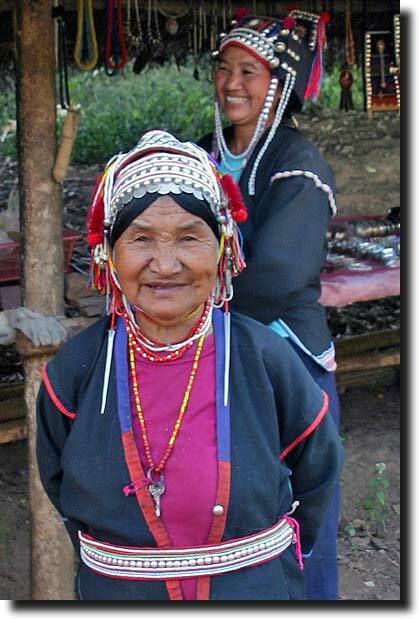 The Hmong are another hill tribe that use to wander the area between Thailand, Cambodia and Myanmar. They do not have Thai passports, but they have special papers to show they can reside in this area around Chang Mai. They, among all the hills tribes, have most fiercely resisted assimilation. For this reason, they are also the least well educated and the most poverty stricken. The Hmong are a fairy well-established minority in Minnesota, so it was especially interesting to see these people closer to their own environment. As with the Karen, it was no surprise to Susan to see that it was ALWAYS the women working! 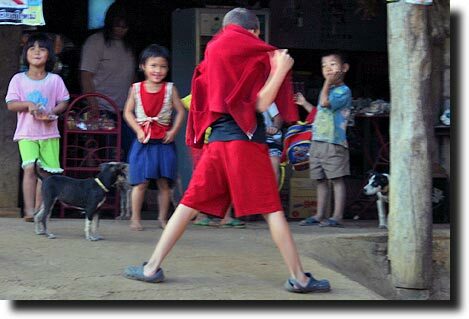 Breck, ever the attention seeker, did an impromptu dance performance for the local children and puppies (warm up for other wild animals?) as we were leaving.